Call 256-712-4171 or send us a note. C&H Cooling is one of the largest and best loved HVAC service providers in the Northwest Alabama region. In business since 1956, C&H Cooling has kept pace with their industry’s advances as well as technology to promote their products and services. They knew their website was outdated and did not accurately represent their corporate brand. 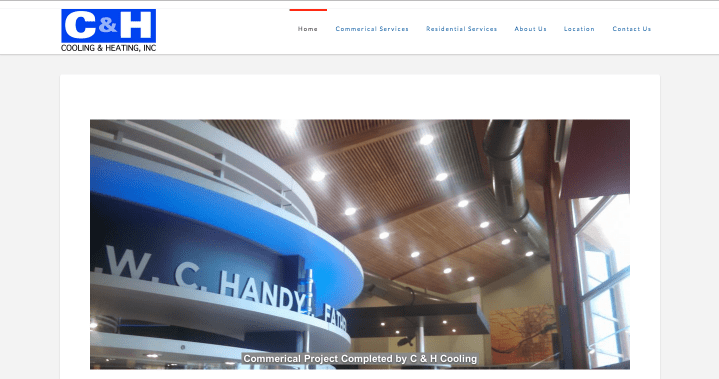 C&H Cooling opted to partner with Shoals Works to upgrade their existing website to a modern looking and responsive functioning online presence. Shoals Works converted their Google Maps listing into a Google Plus account. A detailed custom contact form was created and now directs client business requests through their proper corporate channels. Assist our clients in creating a tailored web presence; representative of their brand, services and products with an eye on reaching business growth goals. © 2013-. ALL RIGHTS RESERVED.